Questions? Call 877-473-3179 (7:00 am — 6:00 pm CST) or email us. 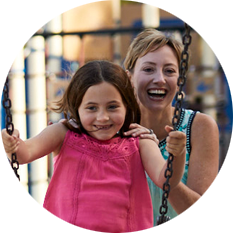 Tips, information, and resources for patients and families managing HT-1. You know those life-changing moments that will never fade from your memory? Mine came in the form of a phone call eight days after we brought our brand-new baby daughter home from the hospital for the first time. Cold, blustery weather offers the perfect opportunity to huddle up inside and enjoy a hot, home cooked treat with friends and family. 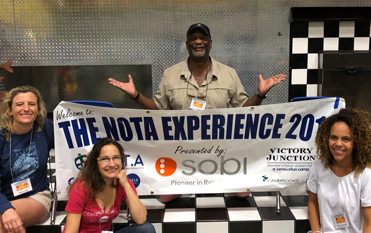 This past summer, five members of the Sobi team headed to North Carolina to volunteer at the Network of Tyrosinemia Advocates' (NOTA) first-ever camp for children with HT-1 and their families. 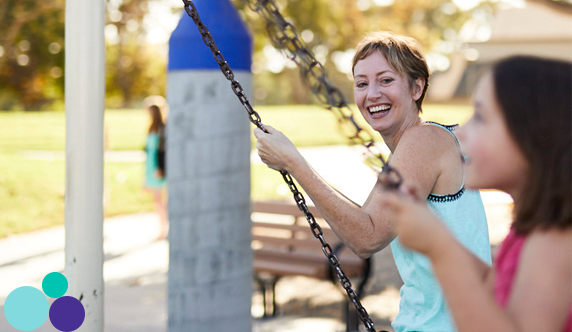 When her son was diagnosed with HT-1, Robynne didn’t know anyone else who was going through what she was. 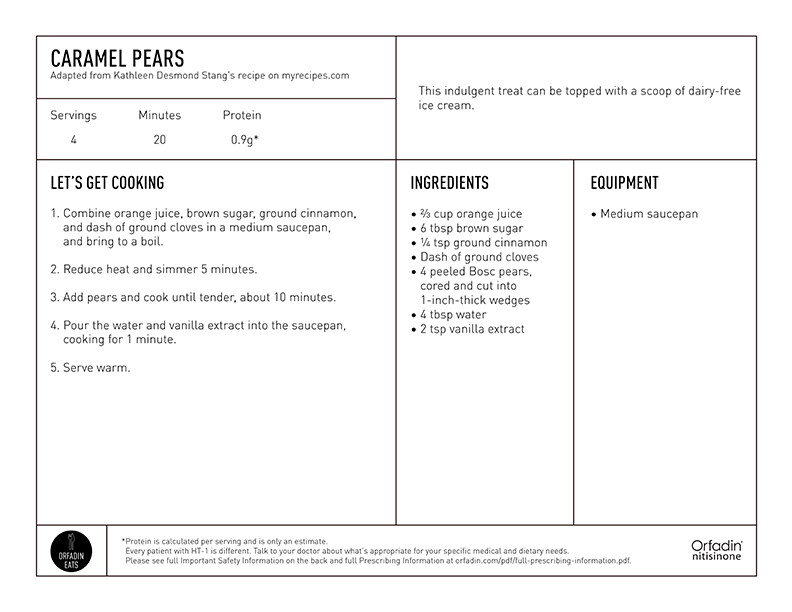 Need recipe ideas? Help navigating insurance? Want to connect with the HT-1 community? Orfadin4U is here to support you. Ordering at a restaurant can be tricky when you or a loved one has a dietary restriction. But that doesn’t mean you should miss out! 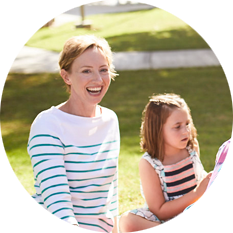 Here are a few tips for families managing HT-1. DO YOU EVER FEEL ISOLATED? Managing a rare disease like HT-1 might cause feelings of isolation. 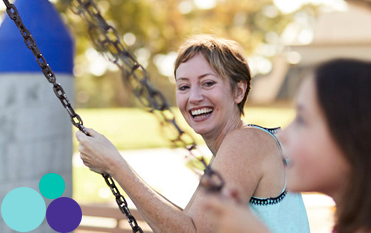 We asked parents caring for children with HT-1 for their advice. From summer campers to college students, there is a lot to celebrate in the Orfadin Generation. With all the picnics, barbecues, and ice cream trucks, summer fun can seem hard to navigate with HT-1. So we put together a handy substitutions guide to help you enjoy all the festivities the warm weather brings. On the other end was a nurse from our pediatrician’s office. One of Claire’s newborn screening tests had come back abnormal. My husband and I were both in shock. How could this be? Everything seemed fine when we brought her home. We went to the doctor the next day. He told us that Claire had a metabolic disorder called hereditary tyrosinemia type 1 (HT-1). She would need to be on medication, formula, and a low-protein diet for the rest of her life. My husband and I were devastated. So many questions flooded into my head: How did this happen? Why did this happen? Where did this come from? I knew I had a lot to learn, but I was going to be my daughter’s advocate every step of the way. Claire’s HT-1 affects the whole family. Because we have to plan for every possibility, we’ve lost some of our spontaneity. But we don’t really have to make sacrifices. We just always try to stay one step ahead. When we go on vacation, for instance, we drive so we can take a cooler filled with low-protein food, and a toaster oven to cook it in. When we eat out, we’re very careful about selecting restaurants that will have things that Claire can eat. Right now, my husband and I record what she’s eaten, but someday soon, Claire will be able to do that herself. Every day, she’s becoming more independent. Some days she wants to help make her lunch. When I’m not pressed for time, I want her to be involved. One day, she’ll be the one making decisions about what to eat. She’s very good about remembering to read the labels and weigh her food. She knows the importance of taking her medicine now, and sometimes I worry about whether she’ll keep it up during her teens and college years. But I try not to get too far ahead. I try to focus on what’s right in front of us. When Claire was first diagnosed, we felt so alone. It’s comforting to know there are other families who are faced with the same concerns we are. That’s why I’ve become so active in the HT-1 community. It’s become a huge part of our lives. I hope that by sharing our story, I can make the journey a little easier for other families living with this condition. And I look forward to the day when Claire will share her story as well. Having a supportive community that understands what you’re going through is invaluable. It isn’t easy to have a child with HT-1, but we’ve been able to adjust by planning and staying one step ahead. Today, although that life-changing phone call is imprinted on my memory, I have so many more happy memories with Claire and our family. Most days, Claire is a joyful, optimistic, silly kid. She doesn’t let HT-1 stand in her way. And neither do I. Want to speak to an Orfadin Ambassador like Shannon? *Every patient with hereditary tyrosinemia type 1 (HT-1) is different. Talk to your doctor about what’s appropriate for your specific medical and dietary needs. 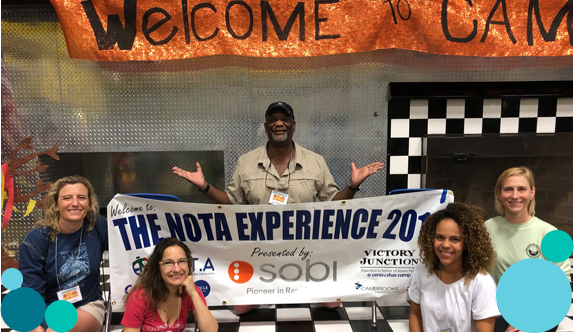 This past summer, five members of the Sobi team headed to North Carolina to volunteer at the Network of Tyrosinemia Advocates’ (NOTA) first-ever camp for children with HT-1 and their families. Sobi was proud to be the presenting sponsor of this historic event for the HT-1 community. On the first night, the president of NOTA asked the families gathered in the camp dining hall to raise their hand if they’ve never met another person with HT-1. About half of the hands in the room went up, illustrating the isolation that so many rare disease patients face. Now that they were finally in the company of others who shared and understood their experience, the children formed deep, fast friendships. 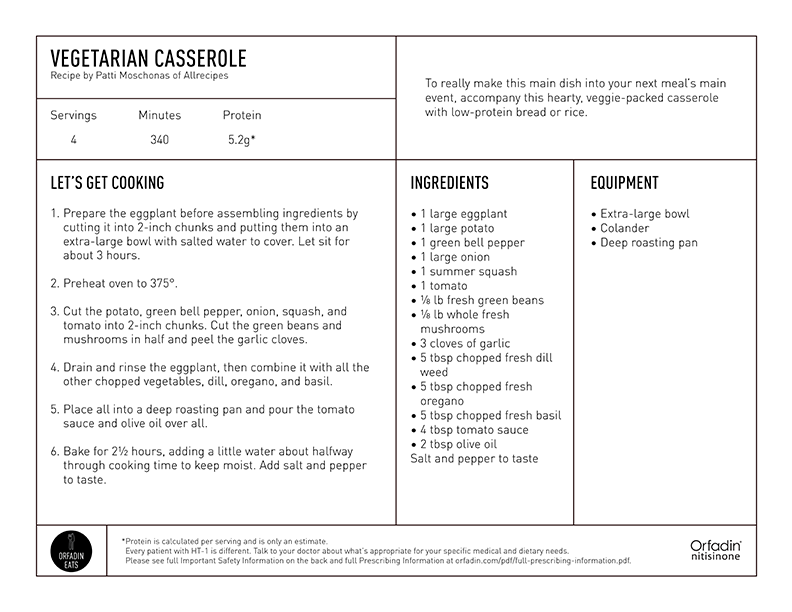 These connections were equally important for the caregivers, who eagerly traded advice on low-protein recipes and apps for tracking phenylalanine. Over the next two days, the 18 families at camp bonded while fishing, boating, riding horses, and playing mini-golf. Several new friends teamed up together to perform in the talent show. And many patients achieved things they never thought they would be able to do. Despite the tremors she suffers from, one patient learned to hit a bullseye in archery. By the end of camp, the kids were all weeping and hugging — and so were many parents and even us volunteers! I feel very fortunate to work for a company that is committed to a community as vibrant and resilient as the HT-1 community. 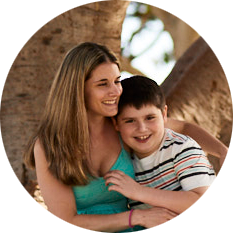 When her son was diagnosed with HT-1, Robynne didn’t know anyone else who was going through what she was. Now, she’s giving families living with HT-1 something she didn’t have: support from someone who truly understands. If they have a menu online, check it out to make sure the restaurant has some HT-1-friendly options. You may also want to call and ask if they’re flexible about substitutions. Some restaurants have gluten-free menus. Ask your server if they offer one. If they don’t, look for the little asterisks or symbols next to the menu items. 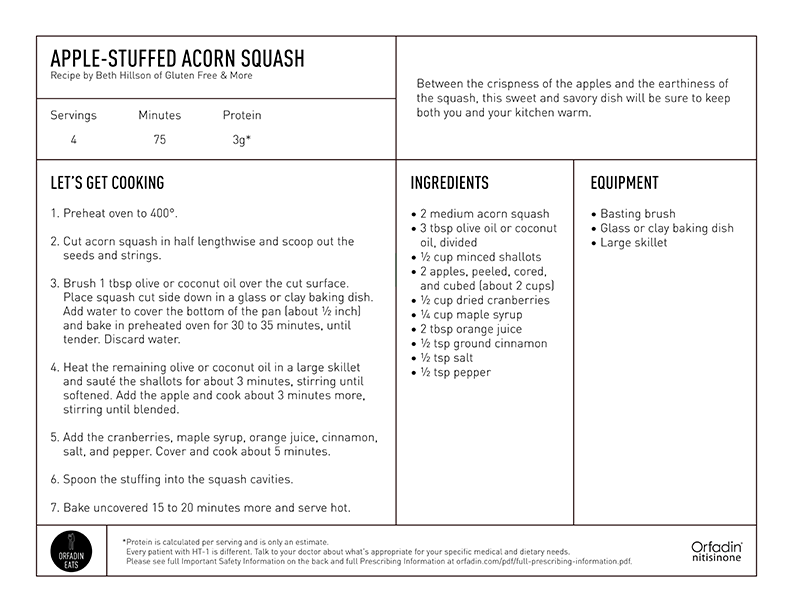 These are sometimes used to call out specific types of dishes, like vegan, nut-free, or gluten-free options. The sides section of the menu usually has plenty of low-protein options, including french fries, cooked vegetables, salads. Try mixing and matching or opting for a double order. Want tips like this delivered to your inbox? Want to talk to someone who truly understands the HT-1 journey? With all the picnics, barbecues, and ice-cream trucks, summer fun can seem hard to navigate with HT-1. So we put together a handy substitutions guide to help you enjoy all the festivities the warm weather brings. *Every patient with HT-1 is different. Talk to your doctor about what's appropriate for your specific medical and dietary needs. Orfadin is a synthetic reversible inhibitor of 4-hydroxyphenylpyruvate dioxygenase indicated for use as an adjunct to dietary restriction of tyrosine and phenylalanine in the treatment of hereditary tyrosinemia type 1 (HT-1). Tyrosine levels can increase in the blood if you do not restrict tyrosine and phenylalanine in your diet while taking Orfadin. Too much tyrosine in the blood can cause serious eye problems or other complications. Do not adjust your Orfadin dosage in order to lower the tyrosine levels in the blood. A reduction in the number of white cells and platelets in the blood have been observed during treatment with Orfadin. Your platelet and white blood cell counts should be monitored regularly during Orfadin treatment. The most common adverse reactions to taking Orfadin are liver cancer, liver failure, low platelets or white cells in the blood, and complaints related to the eyes, including conjunctivitis, corneal opacity, inflammation of the cornea, and extreme sensitivity to light. Tell your physician promptly if you have unexplained eye symptoms, rash, jaundice (yellowing of the skin or whites of the eyes) or excessive bleeding. Use Orfadin during pregnancy only if the potential benefit justifies the potential risk to the fetus. Nursing women should discontinue either Orfadin or breast-feeding based on the recommendation of your healthcare professional. 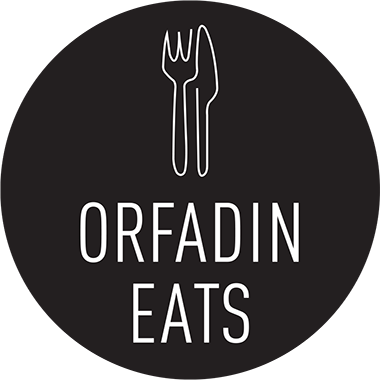 Orfadin is a registered trademark licensed by Sobi, Inc. or its affiliates. PP-4675 © 2018 Sobi, Inc. All rights reserved. 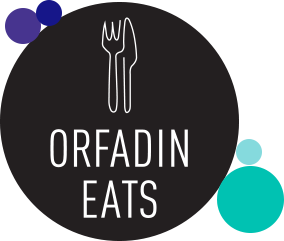 By clicking YES, you will be leaving the Orfadin website and will be redirected to another webpage. Get tips, news, and information about HT-1 and Orfadin. I agree to receive communications from Sobi, Inc. about Orfadin® (nitisinone) and related programs. How are you affected by HT-1?